FINLAND: Hundreds Of Nazis March In Turku [VIDEO] - Joe.My.God. 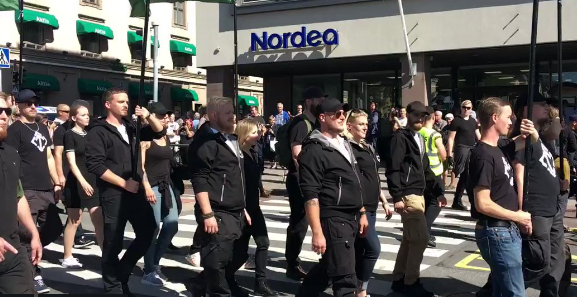 The neo-Nazi Nordic Resistance Movement PVL gathered hundreds of supporters for a procession through the streets of Turku on Saturday. Marchers joined a chant calling for freedom of speech and named individuals whom they said were traitors to the people, including President Sauli Niinistö, Foreign Minister Timo Soini and Foreign Trade and Development Minister Kai Mykkänen. As the procession progressed, onlookers along the route booed and tossed items such as banana peels at the marchers. The Nordic Resistance Movement has appealed a ban on its activities in Finland issued by the Pirkanmaa District Court last December. The Turku Appeal Court will hear the case from 28-30 August and is expected to deliver a verdict by the end of September. Several hundred supporters of the group “Turku without Nazis” made their way into the city centre to chants of “Turku belongs to everyone — except Nazis,” a sentiment echoed by many speakers who had addressed the crowd ahead of the procession.